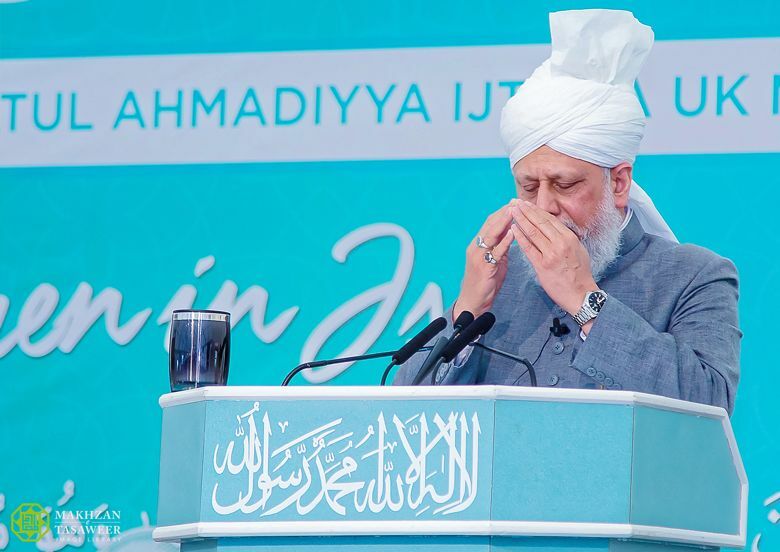 On 24 September 2017, the World Head of the Ahmadiyya Muslim Community, the Fifth Khalifa (Caliph), His Holiness Hazrat Mirza Masroor Ahmad delivered a faith inspiring address to conclude the 39th National Ijtema (Annual Gathering) of Lajna Imaillah UK, the ladies auxiliary organisation of the Ahmadiyya Muslim Community. The two-day event which was held at Country Market in Kingsley, Hampshire was attended by over 4000 women and children from across the United Kingdom. During his address, His Holiness spoke about the extremely high status of women according to the teachings of Islam and cited the examples of the female companions of the Prophet Muhammad (peace be upon him) and of the Prophet Jesus (peace be upon him) as women who had shown remarkable courage and resolve for the sake of their faith. His Holiness began his address by stating that Ijtema itself was a proof of the freedom and independence Islam grants to women. His Holiness said that although Islam has prescribed a division of labour between men and women – whereby women are tasked with the responsibility to ensure the moral and religious training of children and men are tasked with the financial responsibilities of the family and to look after them but this should not be understood to mean that women were ‘incapable’ of doing the work of men. His Holiness said that both Muslim men and women should be ready to serve their faith and that they would be held equally accountable by God Almighty in this regard. His Holiness then gave examples of the sacrifices made by various women for the sake of their faith and mentioned that when Prophet Jesus (peace be upon him) was taken off the cross and emerged from the coffin in which he was subsequently placed, it was women, Mary Magdalene amongst others, who displayed immense bravery and reached Jesus in the very early hours of the morning. 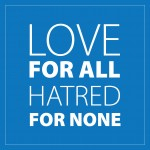 His Holiness narrated the incident of a Muslim couple who were slaves and who were beaten relentlessly by their non-Muslim slave-owner in order to force them to leave Islam. The husband died from the torture, in sight of his wife. The slave-owner then attacked the lady, piercing her stomach with a spear and so she too succumbed to her injuries but remained true to her faith till the her last breath. Another astonishing example narrated by His Holiness was pertaining to the Battle of Uhud, which was fought by the Muslims in self defence against the Meccans who had come to destroy the Muslims. During the battle, the Holy Prophet (peace be upon him) was injured and word spread that he had been martyred. Hearing this, an elderly woman frantically asked a companion of the Holy Prophet (peace be upon him) if he was alive. In response, the companion said that her husband, brother and son had been killed. However, he also informed her that the Holy Prophet (peace be upon him) was alive. Explaining the responsibility of Muslim women in this day and age, His Holiness said they must tell the world about the true teachings of Islam without any inferiority complex. The Ijtema concluded with a silent prayer led by His Holiness. Prior to his address, His Holiness was presented with a cheque for £20,000 by Lajna Imaillah on the 60th anniversary of the establishment of Lajna Imaillah. His Holiness allocated the funds towards the reconstruction of the Baitul Futuh Mosque in London. During the Ijtema, the members of Lajna Imaillah participated in various academic competitions and activities, which included presentations, exhibitions, as well as quiz and speech competitions. A number of workshops were held in the workshop marquee, which hosted trade and industry and health talks and various demonstrations.